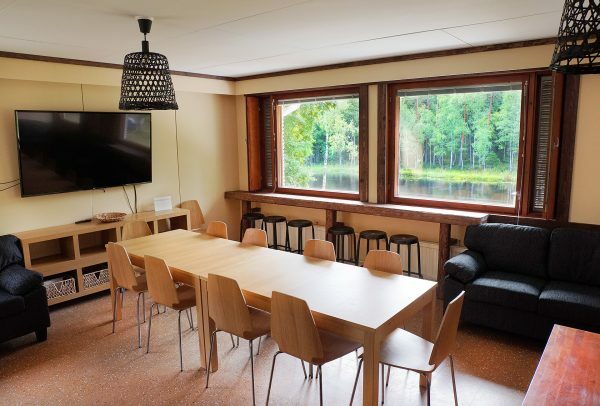 Evo Nature Ltd has bought a former state wildlife research station of Hämeenlinna Evo and started renovating it as a tourist destination. The complex of three villas on the idyllic beach of Kaitalammi will be completed for guest use during the autumn 2018 and the spring of 2019. The core of Evo Peace is the main building of the area, the two-storey Evo Grand Villa. Over 400 square meters of building includes 2 fully equipped kitchens, spacious dining and living areas and 35 beds in 13 bedrooms on two floors. The ground floor of the building also has a sauna compartment with direct access to the terrace and the heat of the bath tubs at Kaitalammi beach. Renovation of the building for tourism will take place in late summer 2018. Two smaller villas, the Evo Pondside Villa and Evo Hunt House, will be ready for use by spring 2019. Both villas are equipped with kitchens, living rooms and saunas. The sauna offer of the Evo Peace is crowned by a traditional wood-heated shore sauna, which is also equipped with its own bath tub. Another old log building, a barn used as a warehouse building, will be renovated for a banquet use during the end of 2018. The area is rented primarily as a whole, but under certain conditions the villas are also available separately. Read more about Evo Peace and ask for an offer!